“Must dos / must sees / must visits” are not much part of our way of life. Machu Picchu was an exception. The site had been on my list since childhood, for as much as I’ve ever had a list. Coen argued why we should go. All valid points, I admitted, but there was this image in my mind of ages ago, and if there is one thing I learned during these past years it is how true Mark Twain’s saying is, no matter how cliché. 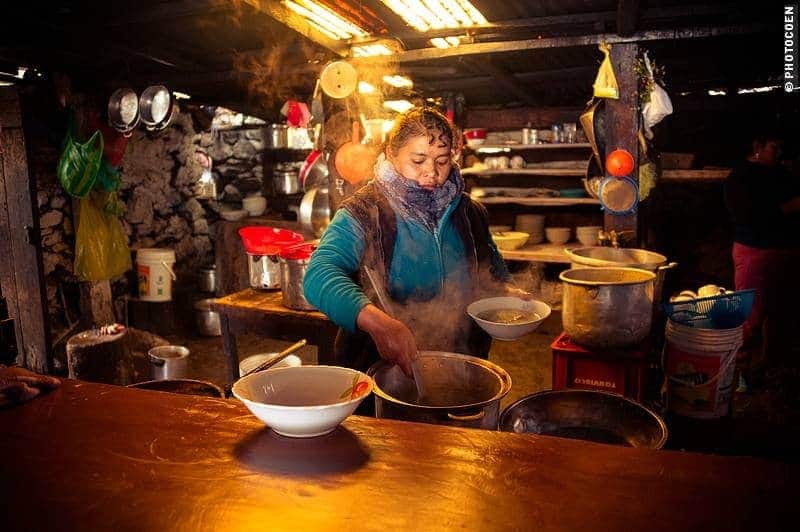 And so, after having had explored Lake Titicaca extensively (read here), we went. I did agree with Coen’s points and didn’t feel like spending a fortune on the (in)famous train to Agua Calientes (gateway to Machu Picchu). 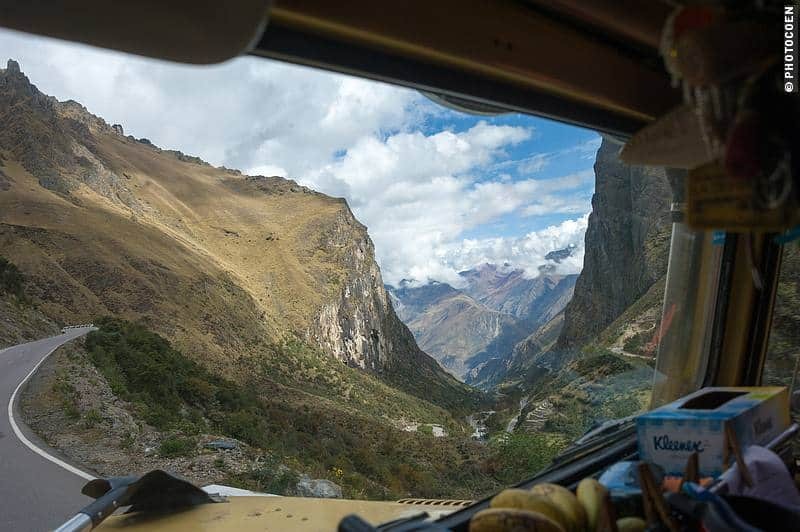 For those who don’t know, you can’t drive to Machu Picchu for there is no road. Getting there involves either taking a train or walking. 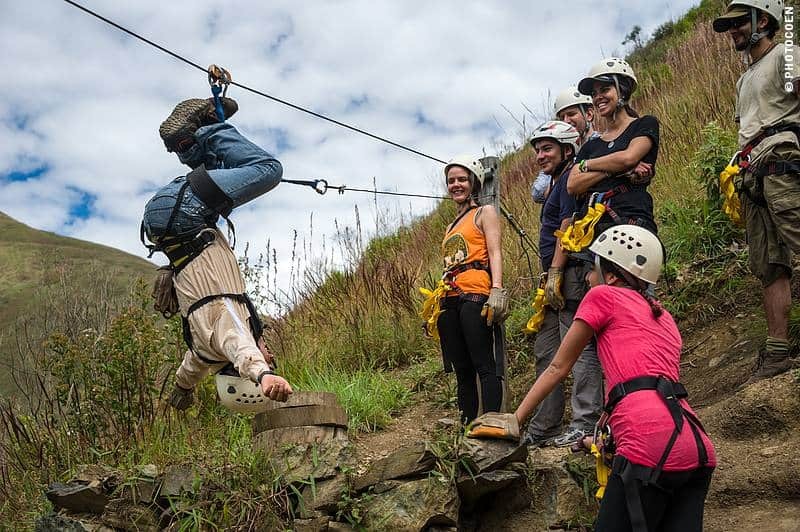 I didn’t feel like joining hundreds of hikers on the (in)famous Inca trail – with mandatory guide – either. 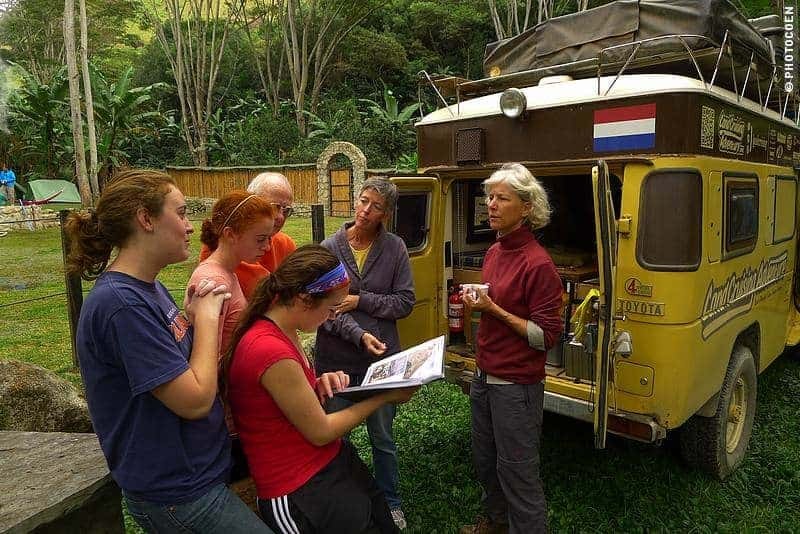 So how were we going to find a unique way of visiting Machu Picchu? Bless Tree and Stevie. 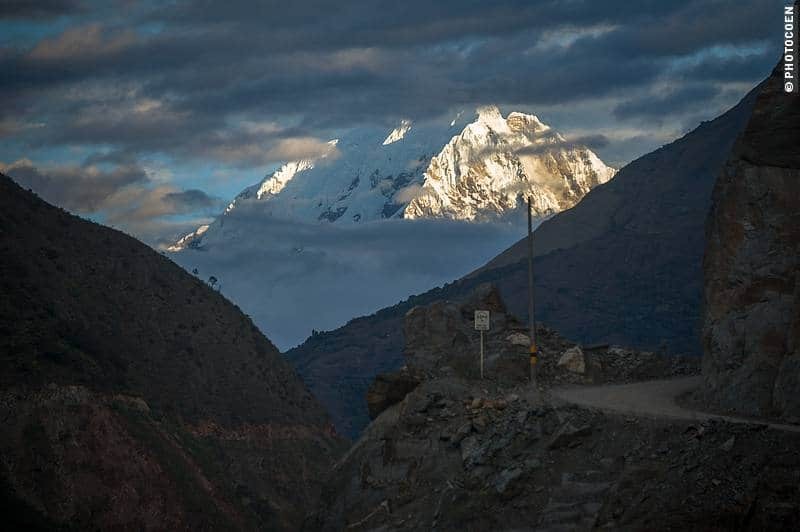 We’ve been in contact with them digitally for I don’t know how long and just before we left Bolivia, they entered the country and at last our roads crossed in La Paz. We had only two days to catch up but we felt having made new friends and we hope our roads will cross more often in the future. Anyway, they gave us the address of their friends Gian Marco and Alejandra of Cola de Mono Ziplining in Santa Teresa. Apparently this was one of the (cheap) back roads to get to Machu Picchu. Sounded like a plan to us. Thanks, Tree and Stevie for the introduction! 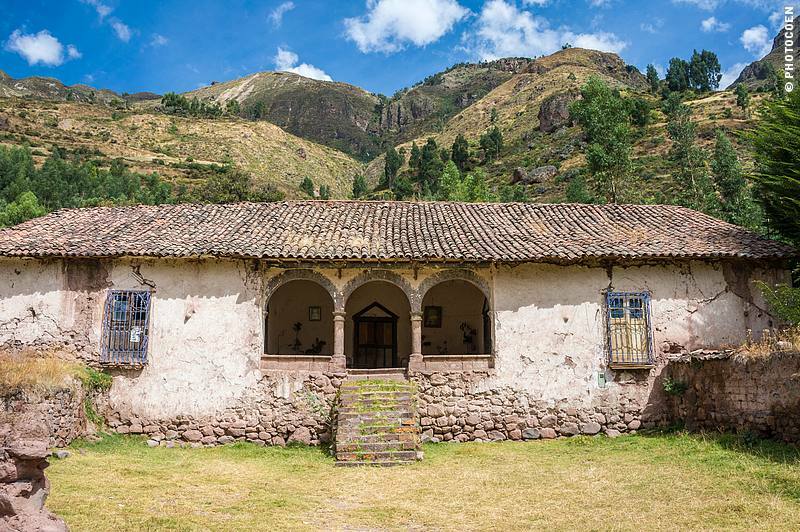 So, from Cusco, which you could say is the gateway to the Inca ruins in Peru’s Andes Mountains, we set off for Santa Teresa. 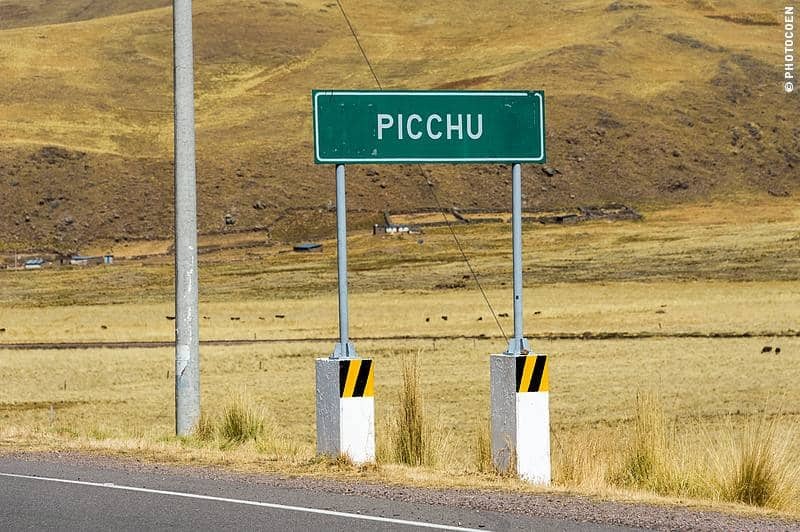 The shortest drive from Cusco to Santa Teresa is via Chinchero. However, this means traversing downtown Cusco and since there were all kinds of processions going on, we didn’t want to go down there. Instead we opted for the longer road via Pisaq which enabled us to drive straight north from the campsite of Quinta Lala – avoiding downtown. We passed the Saqsaywaman ruins and headed into the Sacred Valley of the Incas. That didn’t mean we got anywhere fast. In Pisaq a bridge was under construction or had collapsed, I’m not sure, so we had to detour. This, in fact, was a blessing as it brought us along an incredibly scenic stretch. 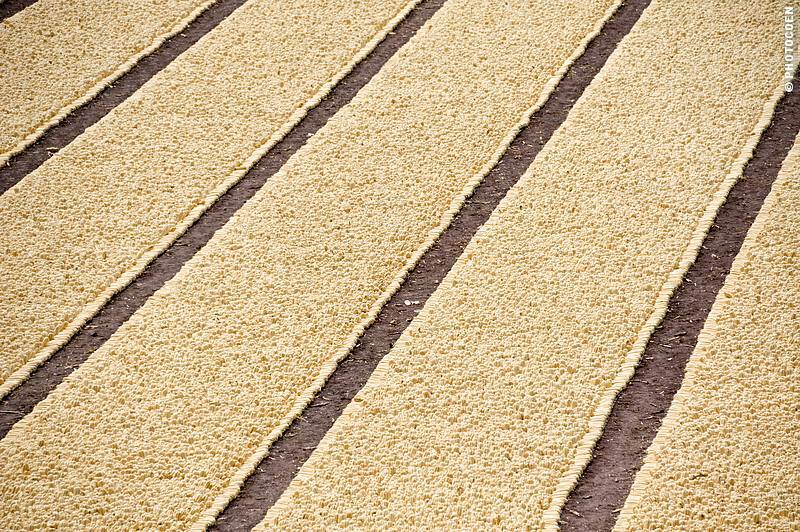 The narrow dirt road meandered through farm fields where farmers had just harvested corn which lay drying in the sun. Houses of adobe, a couple of women doing laundry in streams, people picnicking in the fields – all in all a peaceful, bucolic setting. We took the next bridge and returned to the main road which led straight through the Valle Sagrado. 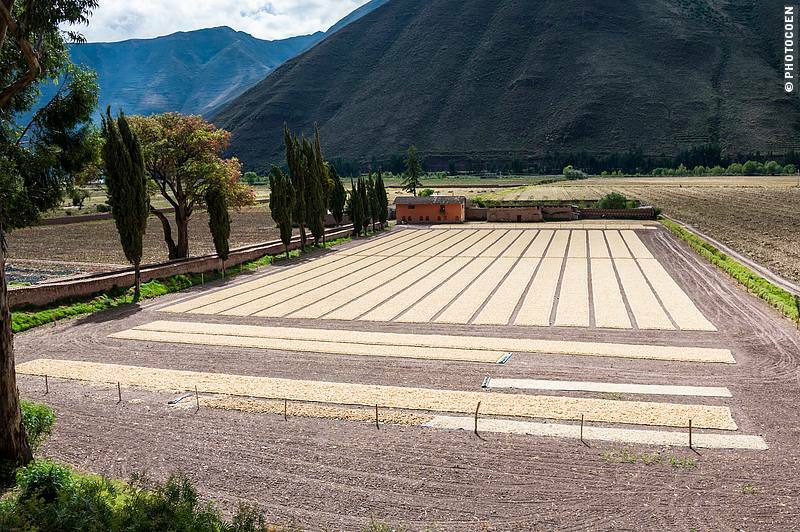 People claim the Valle Sagrado is beautiful, but along the main road it most certainly isn’t. It’s plain ugly with one tourist town following the next, all dominated by restaurants, hostels, and handicrafts (unsurprisingly, no photo of that stretch). 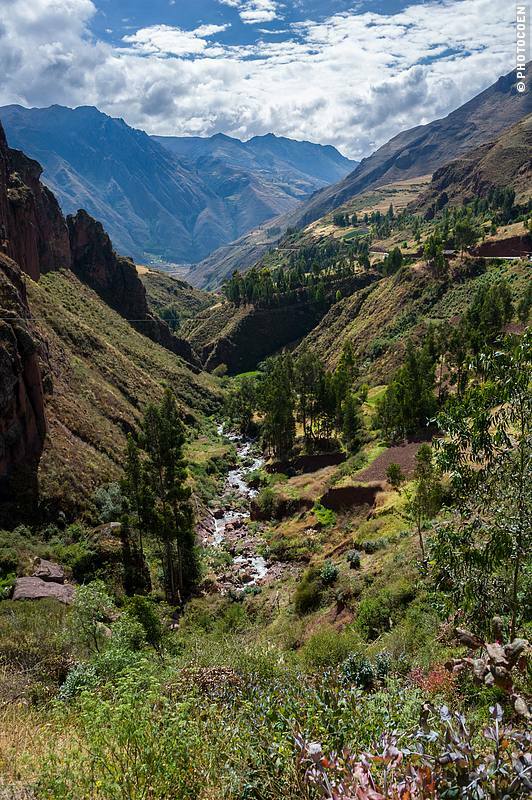 Fortunately, the scenery changed right after Ollantaytambo, the most western point of the Sacred Valley. We entered a rough countryside where hardly anybody lives except for a remote farmer. The mountain slopes are largely void of vegetation. Hairpin curves followed one after the other, all the way leading up to the pass Abra Malaga at 4330 meters with views of the Sacred Valley and snow-capped mountains. At the top we hit the clouds: area de neblina, it is aptly called and we descended without seeing much except for small lakes, locally called area de lagunillas. Quite a peaceful drive along another zillion switchbacks which we could take at a leisurely speed as there was hardly any traffic. Time for some lunch, as it was 3 o’clock. 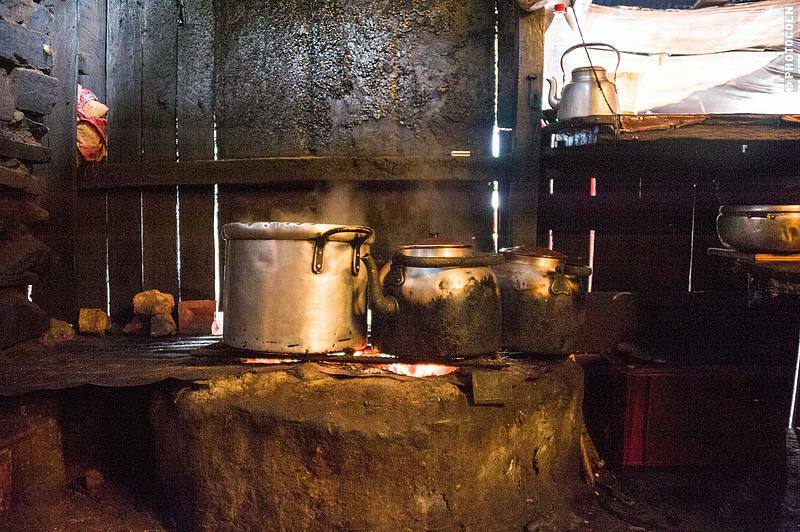 We chose a roadside, soot-blackened restaurant where we devoured a trucha con papas y arroz (trout), with soup and refresco (‘mate’ – a hot tea) for 8 soles. The restaurant has existed for 25 years and the ceiling was pitch black and greasy from all those years of cooking and frying on a wood-burning stove. We continued the descent and entered a subtropical zone with mountains covered in lush vegetation, including banana trees. 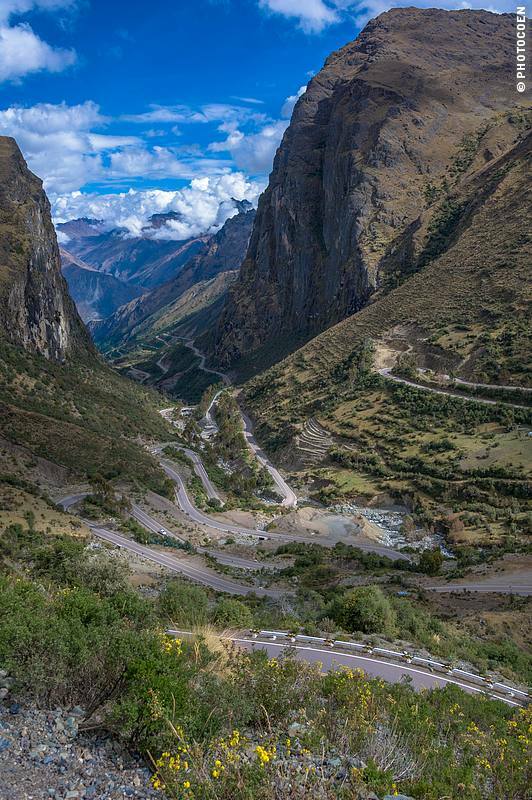 It was just a stunning drive, and I think it will become a highlight of our visit to the Cusco area. However, we should have left earlier. The sun set as we hit Santa Maria. We had another 20 kilometers to go. Up till now the road had been asphalt but we now hit a rough dirt road. We needed an hour to cover the distance. Darkness fell and we descended until some 1300 meters and found Santa Teresa. Campsite Cola de Mono Ziplining lies a couple of minutes drive outside of town, smack in the middle of the wilderness. Fantastic. We met Gian Marco and his family. Mother Annie was there as were two of his brothers, Pierro and Diulio. We were welcomed into the family and together spend a long evening in the outdoor hot tube. It was so peaceful and scenic, sitting in that tub listening to the roaring of the fire in the darkness and hearing the crashing sound of a running river in the background, and looking up to a never-tiring image of a star-studded sky. It’s one of these moments we feel so rich with the lives we live and the people we meet. 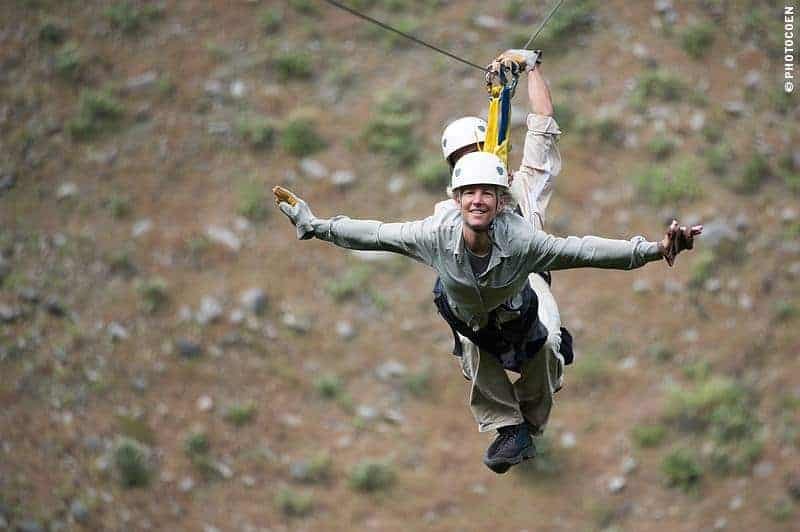 Gian Marco encouraged us to check out his ziplines. 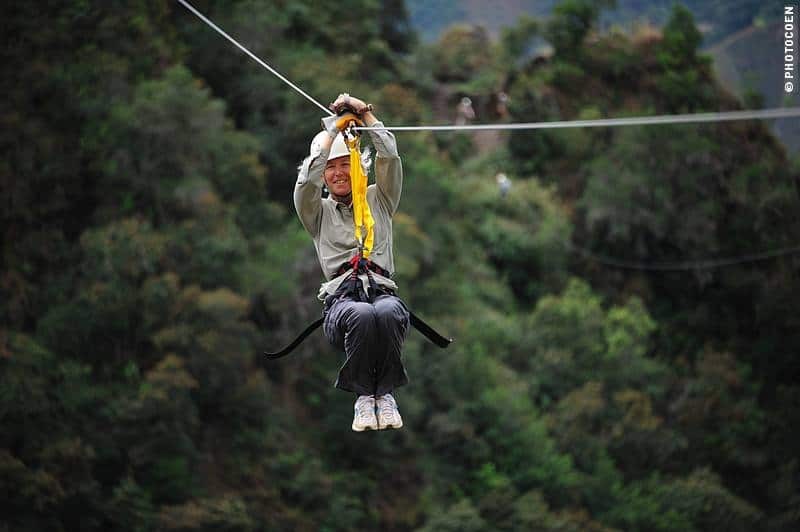 He was the first to bring ziplining to Peru and there are seven cables running across the valley. That sounded like a frightening experience. 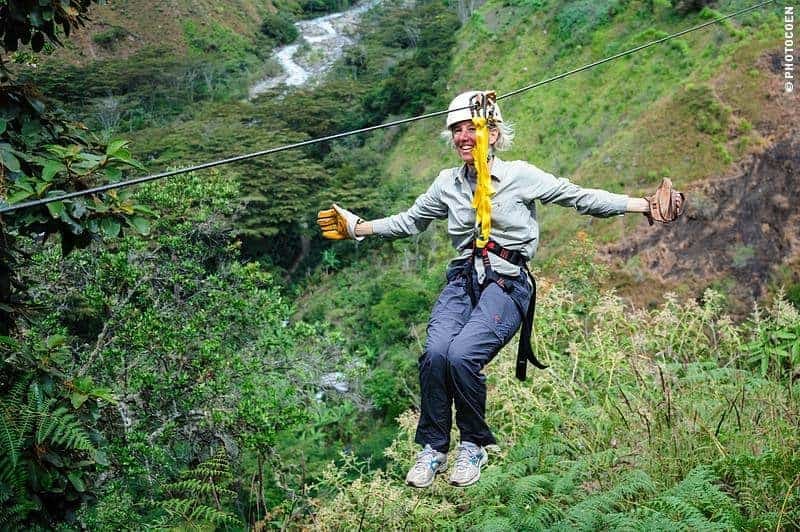 It initially was, but I ended the trail free-styling as a superwoman – what a blast! (here’s more about that thrill). Gian Marco pointed out that Machu Picchu lies only 15 kilometers from here as the condor flies, right after a vertical granite wall on the other side of the river. Now wouldn’t that be something? 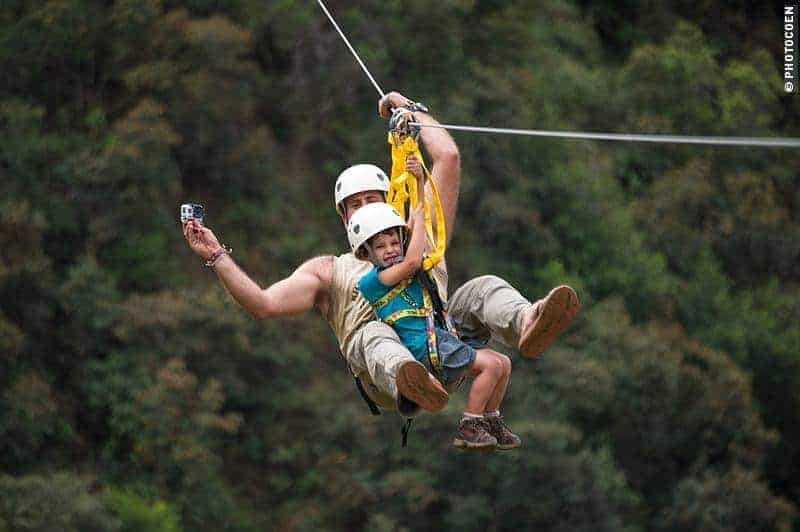 Ziplining to Machu Picchu? For now we depended on the backdoor trail, which didn’t give an adrenaline rush like ziplining, but the scenic path was almost empty and didn’t cost a dime. 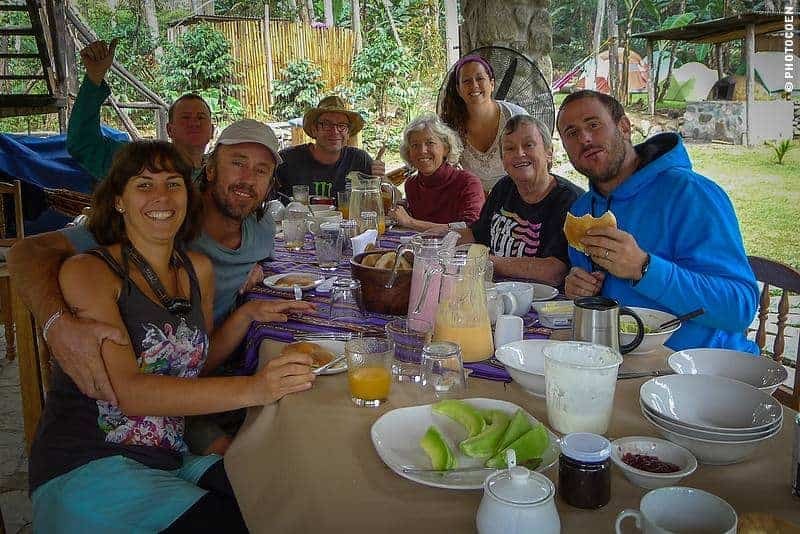 To book a accommodation at the Cola de Mono Lodge, check here.